MOVIE REVIEW: What were the Germans thinking? 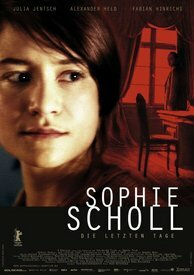 The new film “Sophie Scholl,” a small story of resistance to the greatest tragedy of the 20th century, gives us a big opportunity to fulfill our need for answers. Its most important strength is its simple veracity. Sophie Scholl, her brother Hans and others were arrested for distributing anti-Nazi leaflets at their university in February 1943. The story of the White Rose resistance group has been told in film before, but never so personally and never so directly. The new film has very few actors, very simple sets and no special effects. Almost every spoken word seems to have come directly from historical transcripts. The film is not rated, but could easily have gotten a PG. Several unions helped make it. It comes as a great surprise to find that the film, with a run-time of almost two hours, is longer than most. It whizzes by. Sophie is a great heroine. Actress Julia Jentsch gives a wonderful full-dimensioned and personal portrayal of such a great contributor. But the movie goes far beyond Sophie as it develops the attitudes, understandings and, especially, the fears of her inquisitor and all the other speaking parts. Through inference and dialogue, the participating viewer gains a great deal of insight into what the rest of the Third Reich may have been thinking. And this brings us to the most important value of this work of art: our newfound understanding and appreciation of World War II German thought patterns may have a certain utility in understanding our world today.